Like BioGeoCheMix®, FibreSorb can be applied as  briquettes,  granules or  pellets to simplify soil remediation and to treat heavy hydrocarbons and PAH's in aqueous sediments (these product forms sink in water). Photos show granular form of the FibreSorb product, which simplifies product handling and application in the field and reduces nuisance dusts. FibreSorb is a biodegradable absorbent for the clean up of surface spills of hydrocarbon products and for the bioremediation of hydrocarbon-contaminated soils. FibreSorb is a patent-pending blend of cotton and other plant-based materials with additional nutrients, enzymes and microorganisms that enhance the biodegradation of both the FibreSorb and petroleum hydrocarbons absorbed therein. The used FibreSorb can either be left in place to biodegrade over time (see photos at right) or swept up and placed in a compost pile or container to promote the biodegradation of the FibreSorb product and the co-metabolic bioremediation of the petroleum hydrocarbons absorbed within the FibreSorb, eliminating the need for the disposal of contaminated wastes. The FibreSorb product can be used to promote the bioremediation of petroleum-contaminated soils by mixing the product into the contaminated soils. Large-scale soil bioremediation projects can be facilitated with the use of a pugmill to optimize the mixing of the FibreSorb product with the contaminated soils. The bioremediation of FibreSorb-treated soils can be enhanced by the periodic application of Geovations patented N-Blend nutrients. 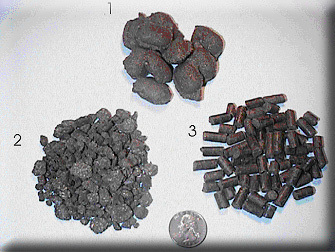 FibreSorb can also be manufactured and applied as briquettes, granules and pellets (see left). These value-added product forms not only simplify the handling and application of FibreSorb in the field, but they also sink in water, providing a cost-effective means for the in-situ bioremediation of hydrocarbons and PAH's in aqueous sediments beneath rivers, lakes, harbors, lagoons and similar, difficult-to-treat environments.